The Earth’s topography results from dynamic interactions involving climate, tectonics, and surface processes. In this chapter our main interest is in describing and illustrating how satellite-derived DEMs (and other DEMs) can be used to derive information about glacier dynamical changes. Along with other data that document changes in glacier area, these approaches can provide useful measurements of, or constraints on glacier volume balance and—with a little more uncertainty related to the density of lost or gained volume—mass balance. Topics covered include: basics on DEM generation using stereo image data (whether airborne or spaceborne), the use of ground control points and available software packages, postprocessing, and DEM dataset fusion; DEM uncertainties and errors, including random errors and biases; various glacier applications including derivation of relevant geomorphometric parameters and modeling of topographic controls on radiation fields; and the important matters of glacier mapping, elevation change, and mass balance assessment. 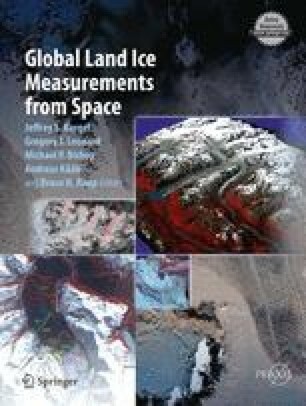 Altimetric data are increasingly important in glacier studies, yet challenges remain with availability of high-quality data, the current lack of standardization for methods for requiring, processing, and representing digital elevation data, and the identification and quantification of DEM error and uncertainty. Quincey was funded by a Research Council U.K. Fellowship; Bishop was funded by the National Aeronautics and Space Administration under the NASA OES-02 program (Award NNG04GL84G). ASTER data courtesy of NASA/GSFC/METI/Japan Space Systems, the U.S./Japan ASTER Science Team, and the GLIMS project.